Purchase a Kayak and get 10% off ALL of your accessories (paddle, sprayskirt, roof rack, you name it)! Use coupon code 10OFF when ordering. Discount will only apply after a boat has been added to your cart. The Sandpiper 130 has a large cockpit making getting in or out of the kayak a breeze, even from a dock or boat deck. This 13 foot kayak comes with a removable Cloud 10 frame seat. Paddle for hours in total comfort, then take the seat with you for a beach chair. The rear hatch is an 18 inch wide oval, making this kayak ideal for hauling bulky gear that won’t fit in a standard hatch. 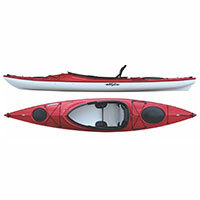 The large cockpit and ample storage space make this kayak a great option for the paddler looking to get on the water with plenty of gear, your dog, or even a small child. Cockpit Size: 48" x 22"
Thermoforming produces a kayak similar in appearance and performance to that of fiberglass, but with a number of environmental benefits. Carbonlite 2000 is an impact resistant multi-layered plastic that is easily repairable. Outer surfaces are harder than other plastics and even gel coat. This provides better abrasion resistance, better UV protection and lighter weights. We are a brick and mortar store. Typically, we have the majority of the boats and boards that you’ll find on our website also on display in our store. We encourage you to stop by and see in person the model that you’re interested in. There’s nothing like sitting in a boat, standing on a board, and seeing and touching it before you buy. Call us at 707-766-8070 to set up a demo.